1. Buy a sellotape dispenser, poundshop ones are great. Don’t spend time fiddling about with trying to find the end. £1 dispenser = a lot less stress. 3. 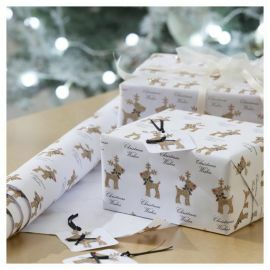 If you have time to decorate your presents with ribbons and bows buy a plainer looking paper. If you don’t have the time or the money just buy a pretty patterned paper, glittery £2 rolls from Tesco are great and on 3 for 2. 4. Have a rubbish bag out for price labels and sellotape scrag ends. 5. Give yourself as much room as possible. Do it on a table if you can, bending over whilst sitting on the floor can do your back in after a while. 6. Listen to music, if I wrap whilst watching a film it takes twice as long. 7. Drink a large glass of mulled wine as you go!